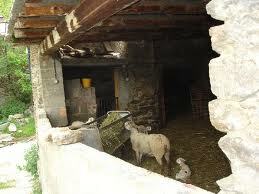 In ancient farm households in many parts of the world, animals are kept under the house in the winter or at night. The advantages are that it keeps them safe, and that they provide heat for the family above. 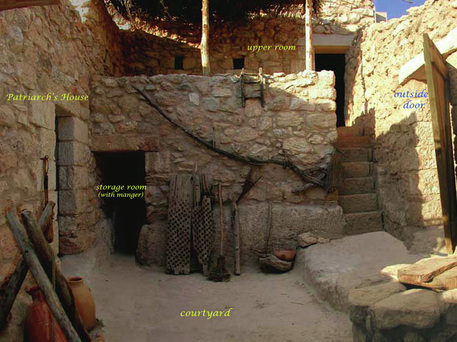 In the ancient Greek world, the upstairs living and dining area was called the ‘kataluma‘. This is the word used in the story of Jesus’ birth in the Gospels, but commonly translated into English as ‘inn’. When Joseph went to visit his family in Bethlehem towards the end of Mary’s pregnancy, there was ‘no room in the kataluma‘ – and no privacy for childbirth either – so naturally Mary had the baby downstairs and put him in a manger. Again, the manger was a logical choice: off the ground, and away from the animals that were out in the fields with the shepherds (and angels…) It wasn’t winter, or the sheep would have been inside; it was the spring lambing season, or the shepherds wouldn’t have been so attentive. And if anyone has better pictures of a kataluma, please share! This entry was posted in Religion, Society and tagged Bethlehem, birth, Jesus, Joseph, kataluma, Mary, no room in the inn, shepherds. Soy un creyente de pocos años, vengo de la iglesia catolica y siempre pense que el relato de Jose y Maria pidiendo alojamiento de acuerdo a la interpretacion del pesebre viviente de San Francisco de Asis, hacia parecer a Dios Padre como un tanto irresponsable, siempre crei que debia haber algomas algo que tenia escrito y pasaron por alto los escritores y traductores biblicos, hasta que en 2003, me tope con un estudio comentado por un obispo chileno que me dio una serie de pistas que he venido investigando desde entonces y cualquier aporte que necuentre grande o pequeño me ayuda a entender como ocurrio el hecho historico mas trascendente e importante de todos los tiempos, el nacimiento del Mesias, gracias a Dios porque sigue usando a sus ciervos, para revelarnos las verdades ue debemos conocer para hacernos libres. Note: I have corrected a couple of minor errors in phrasing and translation, but I’m leaving Google’s “deer hat” for “ciervos” because, if someone is going to say everything in a single breath, they are entitled to a bit of silliness. Intentional or unintentional. Daniel, good luck in your studies of the Bible. Personally, I recommend http://www.reddit.com/r/atheism/ for a good thought-provoking analysis of it. Robin, reading your interesting article, I have realized something. I will do a correction in your translation of Daniel’s comment. Daniel Duarte uses not correctly the word “ciervos”; the right word is “siervos”, servants. God bless both you.